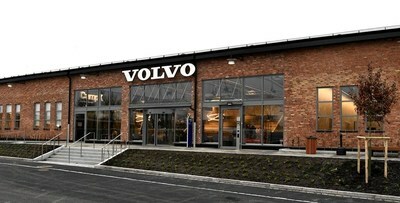 GOTHENBURG, Sweden, March 28, 2019 /PRNewswire/ -- The Volvo Group has a legacy of being at the forefront of developing and transforming the transport industry. The ambition is that the introduction of CampX by Volvo Group – a concept for innovation and collaboration, inaugurated today, will maintain and strengthen that position for the future. "By establishing CampX by Volvo Group we will drive the transformation to new disruptive business models and technologies, with a focus on automation, electromobility and connectivity. At CampX, we will explore and accelerate new ideas using an entrepreneurial mindset. CampX will serve as an enabler for a cultural change across the complete Volvo Group, where innovation will be even more at the center of what we do," says Martin Lundstedt, Volvo Group President and CEO. The world is currently facing many challenges where new technologies combined with new business models have shown potential to contribute to greater societal sustainability, less congestion and better accessibility. CampX will provide a perfect arena to exploit this potential and for Volvo Group to stay ahead as one of the most innovative companies in the transport industry. "We have gathered 400 of our technical and business experts within automation, electromobility and connectivity in CampX . We will invite selected stakeholders from the partner eco system, like customers, companies, academia, authorities, and so on, to join us to co-create and test new ideas using laboratories and workshops at the CampX facility," says Lars Stenqvist, CTO Volvo Group. From the opening day CampX will be teamed up for exciting collaboration projects with suppliers, external partners and start-ups. "We think of CampX as a place where the Volvo Group and its partners can benefit and learn from each other in a trusting and innovative environment. We are very excited and happy to open up the doors to our first CampX, inaugurated today in Gothenburg, Sweden, where we have converted an old factory building into a state-of-the-art inspirational and attractive innovation hub," says Martin Lundstedt.